Expand your outdoor living space with custom decks and railings. Every custom deck job begins with a free, no-obligation estimate at your home. 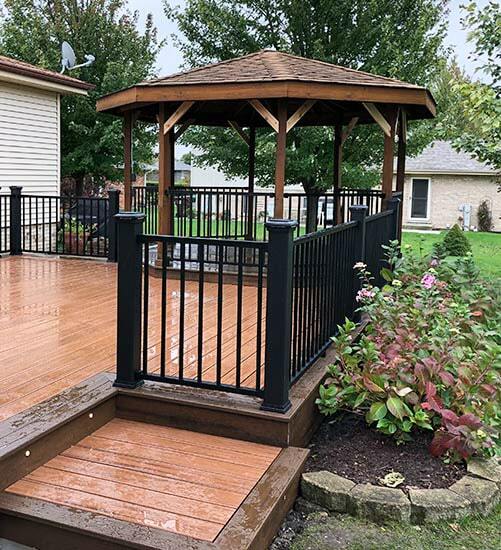 We will take the time to listen to your needs and understand what you want to achieve with your deck area. Next, we’ll review all the ways we can bring your dream deck to life, including selecting the best material, incorporating your existing landscaping, and the architecture of your home. We’ll also go over any extra features you may want including planters, benches, and lighting, and go over options for railing styles. 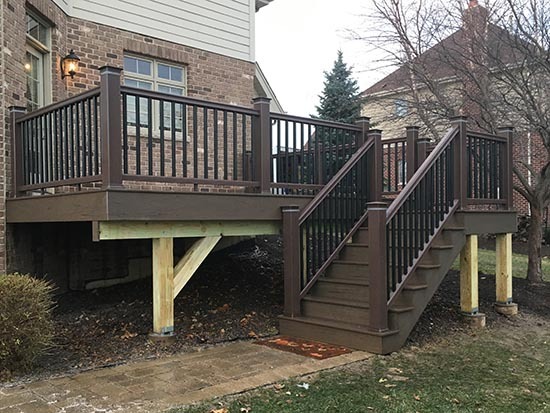 You’ll receive a custom deck design and estimate for the project and we’ll give you time to review so you can make the right decision for your home and family. Once you’re happy with the design and the estimate, the next step of the process is to create blueprint drawings to submit with permit applications and order the materials. Once all the permits are arranged and the materials are in, we’ll begin construction on your new deck. Choosing the right materials for your project can seem confusing, but we’ll make it easy. Wood provides natural beauty to your outdoor space, but it does require periodic maintenance to ensure a long life. Choose from traditional pressure-treated pine and cedar or exotic hardwoods to achieve a natural, durable surface for your decks and railings. Composite materials are long-lasting and maintenance free, and they are designed to look like natural materials. Choose from capped composites that are made from recycled materials or high-performance composite designed to resist fading and damage. PVC products are another long-lasting, maintenance-free option that’s made to look like natural products. We offer several hardware types with PVC decking including a hidden fastener system for a smooth finish. Metal provides a sleek, sophisticated finish with almost no maintenance needed. Frames are typically built from pressure-treated wood, but a steel frame can be built with added expense. Rail systems are custom made and can include a mix of materials. For example, choose cedar rails with aluminum balusters or composite rails with horizontal stainless steel cabling. Summertime in northern Illinois means heading outdoors and enjoying time with friends and family. Complete your outdoor living space with a variety of solutions. Expand your living area by finishing the underside of your deck to build a waterproof room complete with lighting, ceiling fans, screens, and more. Host your next party with confidence knowing your guests will have cover if it rains! Or, create a cozy screened-in patio, classic pavilion, decorative pergola, or cover your existing porch. Make the space even more useful by adding an outdoor cooking area or fire pit for the family to gather around. If you have a flat rooftop space, why not build your own rooftop deck? Add planters, lighting, and decorative features to personalize the area and make it feel like home. Only your imagination is the limit. Our experience includes a range of projects, from relaxing poolside decks to expansive, Southern-style wraparound porches. Every home has its own unique architecture and challenges. Every homeowner has his or her individual needs and dreams. Here’s what it looks like when we use our expertise to bring your ideas to life. We love what we do and you will too! With your ideas and our expertise, we can design and build your dream deck or patio. © Copyright Mitchell Construction. All Rights Reserved.